Dermatology terminology is an attempt to describe dermatological diseases with the verbiage dermatologists actually use in speaking to each other. With many disorders, the description can be reduced to a word, or a phrase, or an acronym. This is termed the "keyword" phenomenon, where such a keyword substitutes for a much fuller and much lengthier formal presentation. The keyword, together with a photo of the disease it represents, will be coupled with a short description and a literature reference for that disease. The photos will be from Dr Allens own collection or the collection at Drexel Dermatology. Dermatology is unusual as a medical specialty in that the traditional language of medicine often does not fit the needs of the specialty. The formal language of dermatology is so distinctive, it can take many months to learn, much like a foreign language. Similarly, dermatopathology has its own language that differs dramatically from the language of pathology. 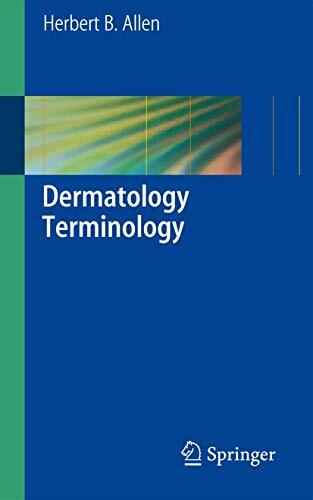 Dermatology Terminology uniquely describes and catalogs dermatologic diseases with the verbiage dermatologists use when speaking to each other. With many disorders, a description can be reduced to a word, phrase, or acronym, where such a keyword substitutes for a much fuller and lengthier formal presentation. This book is a compilation of these keywords, together with photos of the diseases they represent, coupled with short descriptions and literature references for each disease. The descriptions have been prepared over many years for dermatology residents and medical students and as such this book is a key learning resource for all students of dermatology. Herbert B. Allen Herbert B.